There is one post tagged LinkedIn Today. Over the years, LinkedIn has been adding “content” to the data feed and to the right-hand side of the home page which cannot be turned off in the preferences – things like Jobs You May Be Interested In (I’m not) and Companies You May Want To Follow (I don’t). 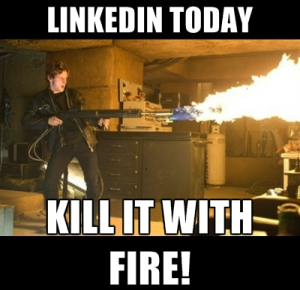 The worst of these is the LinkedIn Today blob at the top of the updates. When it initially showed up, I put in a ticket asking how to turn it off and was told that they were working on it. Six months later I hadn’t heard back, so I asked again (and again) and they have now informed me that it’s permanent.